Are You Ready for Zilla-Mania! All day long I have had Blue Oyster Cult’s classic “Godzilla” repeating on my truck CD player. Over and over the lyrics and words have amped me up to a point of mystic reality that a human “Godzilla” and the swallowing International entourage that encompasses his MLB mystic via frenzied Japanese media, a sudden influx of Asian fans with personalized and cryptic homemade signs around Tropicana Field. You can bet the moment it was announced that the human version of “Godzilla” was on his way to the hamlet of St. Petersburg, Florida, the Rays Communications Department’s cellphones and email addresses have been bombarded with requests both for video and photo of the historic first appearance of Hideki Matsui in a Rays uniform. I did not get into the Trop. early today to witness the explosion when Matsui finally ascended the dugout steps and into the media gasping and camera clicking frenzy. Simply put, this might be one of the biggest moves the Rays have made in a while that could turn their Designated Hitter position into a true powerhouse spot in the nightly line-up. It is going to be extremely interesting to see how Rays Manager Joe Maddon juggles the animated Wolverine/ Luke Scott and Matsui in and out of the Rays line-up, especially since both smash the ball from the left side of the plate. But think about this all for an extended second, with the addition of Matsui who is a finessed professional hitter, the Rays finally have a guy who Maddon can be put behind anyone from Desmond Jennings (when he returns from the D L) to Matt Joyce, Evan Longoria or Carlos Pena and they will automatically see more pitches that they might be able to clobber themselves. Matsui might finally be able to help elevate the DH position for the Rays the way we hoped Manny Ramirez would have in 2011 before his own personal substance debacle. Even the idea of Matsui playing in the field is not far-fetched especially during the Inter-League slate of games in National League parks. With the idea Scott might play a bit of First Base or the outfield plus Matsui drawing time in the outfield too, it might take the usually lighting-quick Rays outfield and make it a bit more…positioned to keep the big play from dominating the inning. Even though Matsui has 9 years in the major leagues, it has taken its toll on his knees, but with him missing almost 2 months of the grit and grind of baseball, his knees and health might be timed perfectly to get him through the Inter-League schedule, then DH and be a valuable pinch-hit weapon for Maddon. 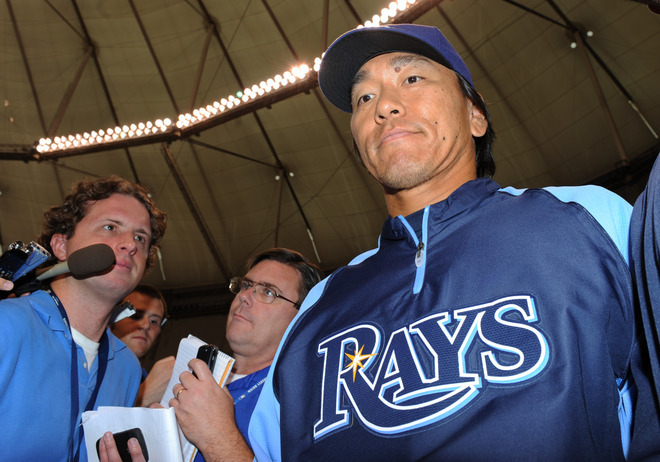 Of course Maddon and the Rays will not elevate the call-up of Matsui and anything “special”, but the moment the whisper was first uttered he was destined for the MLB before June, people have been lying in wait for just his arrival. Of course he will have to get used to a new band of baseball brothers, who tend to keep their clubhouse loose and free of the media drama that unfortunately follows Matsui from his homeland. 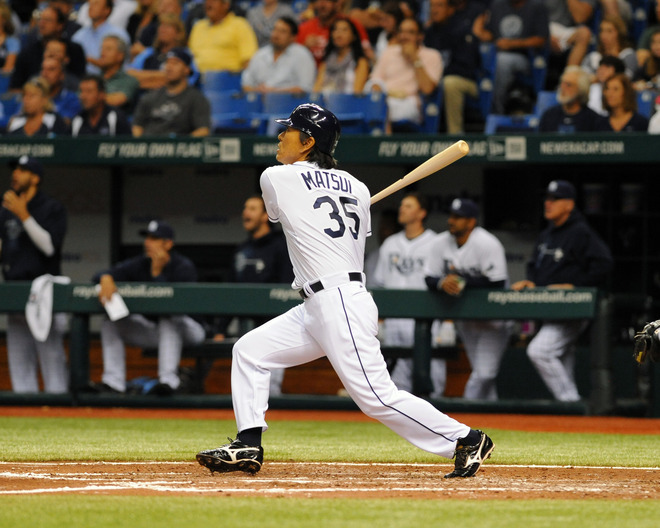 But there is a hidden gem here some people have not realized yet, but they will as soon as the MLB and Rays Team site begin to see a run on personalized Matsui # 35 jerseys and any collectible that tends to fall the way of E-bay or the Rays Baseball Foundation’s charity online auctions. 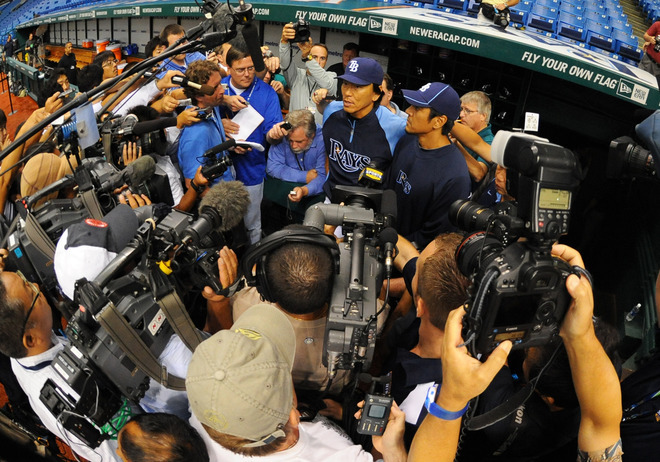 Instantly the Rays will get extra press and free advertising back to the television sets in the Far East nightly as video replays and Matsui box scores and highlights hit the Web. 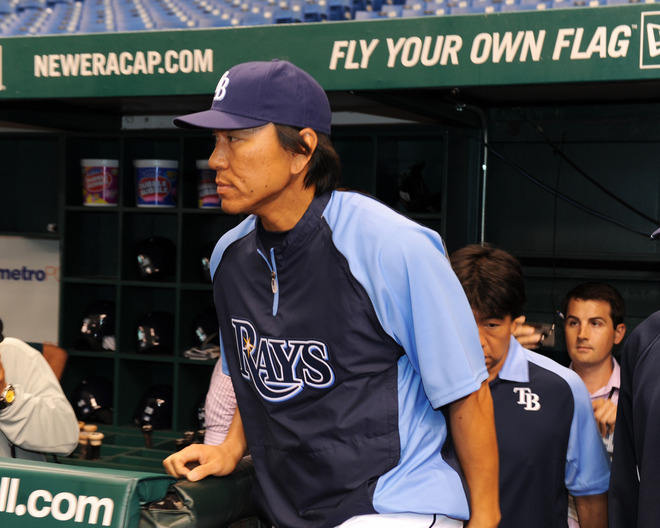 Do not be surprised if you see more Japanese advertisements being showcased on FSN/Sun Sports during Rays telecasts, especially on the MLB Network where fans in Japan can watch the game at almost anytime, even in the middle of the night as they get their fill of Matsui. Don’t be surprised if the blue screen to the right of Home Plate gets a few more swirling Matsui-inspired signs that will rotate as Hideki digs into the left-hand side of the Batter’s Box. This is a big thing people. 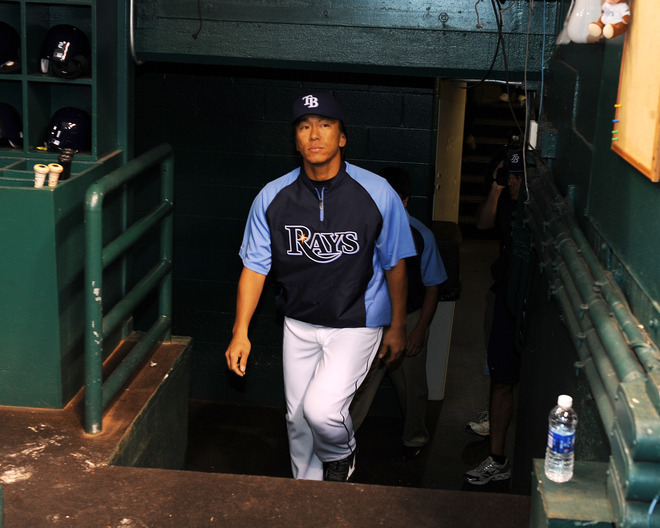 Not only does the call-up of Matsui possibly give us a profession power hitting bit of muscle, but it will open a new segment of Rays marketing, far out-reaching into the Asian baseball market as well as bring some new faces and excited fans into the Trop. Going to be amazing tonight if Matsui gets a hold of a hanging curveball and deposits it into the right field stands. Do not be surprised if the Raysvision crew already have their own “Godzilla” inspired video clip keyed up and ready to go full ballistic on the Jumbotron at the crack of the bat. When I was a small child I saw those words emblazoned on a Los Angeles Police Department car in the popular TV show “Adam-12“. It took a handful of years for me to personally experience and learn how important and honorable those words really are, and know the courage and bravery needed to ascend to that plateau of serving and defending the liberties we have been granted by generations of fighting souls. On this day of memorial and remembrance, I want to honor those who have given of themselves for the freedoms that all of us at one time or another have mistakenly taken for granted. We have all at a moment of lapse forgotten the sacrifices, perils and constant danger that lurks outside our democratic comfort zone. I owe a huge debt of gratitude and heartfelt “Thank You” to those who have paid the ultimate sacrifice so I can enjoy the life I have in this country. 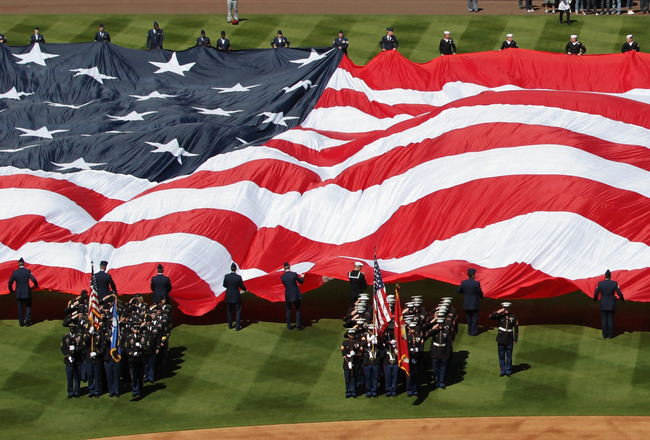 On this Memorial Day I feel a moral imperative to pay extreme homage to those who have also played this beautiful game of baseball, plus interrupted their careers to answer the call from their nation to serve with honor and dignity. Instead of talking about The Tampa Bay Rays, or even Major League Baseball today, I want to salute 2 Baseball Hall of Fame members who answered the call of duty to serve in our military ,and unselfishly sacrificed pieces of their professional careers for our freedoms today. I want to honor them for their commitment to this great country and hope that we all remember them today along with the many other brave men and women who should be saluted daily for their courage and heroic deeds in defending our freedoms. It has been said that over 4,500 players swapped their baseball uniforms for the assorted colors of the United States Military just during World War II. Not all of these brave men were in the Major Leagues at the time, but the entire minor league system in this country saw platoons of men from within the minor league ranks also volunteer and enter the draft during the war. They did not get the fan fare of the high profile MLB players, but their part in the military machine was just as important and vital to the overall success. It has been estimated that at least 125 members of baseball minor leagues gave the ultimate sacrifice during World War II. We all know some of the hallowed names associated within the game with military ties like Ted Williams, Hank Greenberg,Joe DiMaggio and former Phillies Manager Danny Ozark. 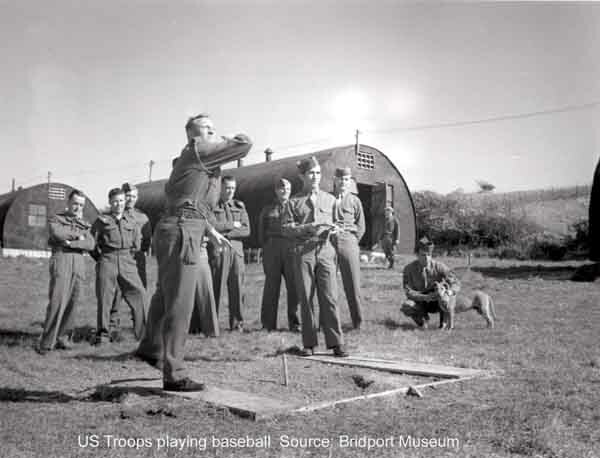 Yes, even Managers, Coaches and Umpires also were among those who joined the ranks of the many military branches to fight during the European and Pacific Theatre campaign. Today I am going to feature 2 of the many who left their cleats and gloves in their lockers and exchanged them for the weapons of war. 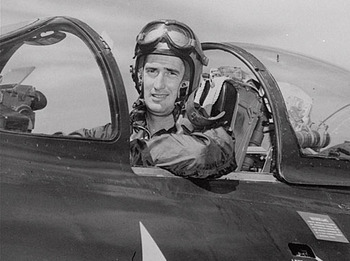 I have chosen Navy Chief Specialist Bob Feller and Army First Lieutenant Warren Spahn as my blog subjects. Both of these men have been personal baseball heroes of mine while growing up and I felt it was only right on this day of remembering the sacrifices and losses of so many brave souls to include these 2 baseball greats who gave up time willingly during the formative years of their brilliant baseball careers to fight along side people like my father and his three brothers. There currently are over 33 inducted members of the Baseball Hall of Fame in Cooperstown, New York who served during World War II. Memorable players like Yogi Berra, Joe DiMaggio, Luke Appling, Larry Doby, Bobby Doerr, Monte Irvin, Ralph Kiner, Johnny Mize, Pee Wee Reese, Phil Rizzuto, Robin Roberts, Enos Slaughter, Duke Snider,and Ted Williams. Many of the top tier players of that era of the game served during World War II. 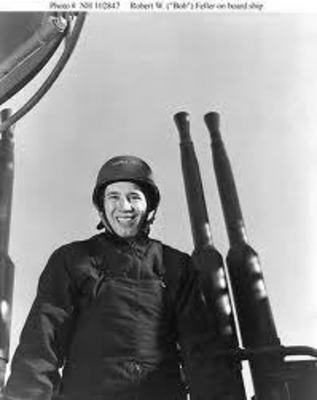 On December 8,1941, the day after the Japanese unprovoked attack on the fleet of Navy vessels anchored in Pearl Harbor, Hawaii, Cleveland Indians fireballer Bob Feller enlisted in the United States Navy. 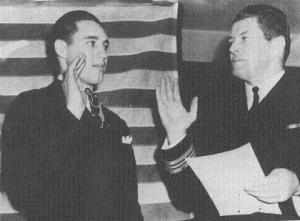 He was sworn in by former World Heavyweight Boxing Champion, Gene Tunney, at the Chicago courthouse. The USS Alabama returned to the United States in the spring of 1945, and Feller was assigned to the Great Lakes Naval Training Center in upper Illinois, where he coached the baseball team and pitched to a 13-2 won-loss record with 130 strike outs in 95 innings. He returned to Major League Baseball in August 1945, and in his Indians debut at home in Cleveland, he beat the Tigers, 4-2, in front 46,477 adoring fans. In January 1946, Feller set up a 3-week school in Tampa, Florida, to develop the baseball skills of returning veterans – both aspiring ballplayers and those with some organized baseball experience. 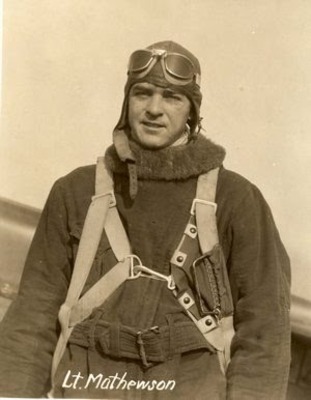 Men paid for their own transportation to the school as well as room and board, but the instruction by fellow major leaguers was free for the returning veterans. It was seen as a time to reflect on both the future and the past and gave the players a sense of “normal life” again. 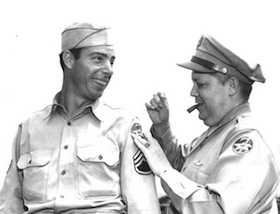 Feller spoke about his military service some years later in a segment on of ESPN’s Major League Baseball Magazine. Feller said “I’m very proud of my war record, just like my baseball record. I would never have been able to face anybody and talk about my baseball record if I hadn’t spent time in the service.” Then again in 2005, he got a chance to chat with people online during a visit to the Baseball Hall of Fame in Cooperstown, New York. One of the many questions he was asked that day online was whether he had any regrets about serving in the war? “No, I don’t,” Feller replied. 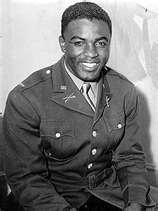 “During a war like World War II, when we had all those men lose their lives, sports was very insignificant. I have no regrets. The only win I wanted was to win World War II. This country is what it is today because of our victory in that war”. In March 1945, the 276th were responsible for maintaining the traffic flow across the Ludendorff Bridge at Remagen, the only remaining bridge to span the Rhine. The bridge was under almost constant attack from the Germans who were desperate to stop the flow of Allied forces into Germany. At the same time they were to build a 140-foot Double Bailey bridge nearby. On March 16, Spahn was wounded in the foot by bullet shrapnel while working on the Ludendorff. The following day he had just left the Ludendorff when the entire structure collapsed into the river with the loss of more than 30 US Army Corp of Engineer soldiers. The entire 276th unit received the Distinguished Unit Emblem and for their efforts to keep the bridge operating, while under constant enemy fire, Staff Sergeant Spahn received a Bronze Star, Purple Heart and a battlefield commission as a second-lieutenant. It would take almost two decades for Spahn to again dorn a military outfit. But this time it was for a much different reason entirely. He had been asked to be a guest star on the Vic Morrow military show “Combat” as an extra in a scene. So Spahn again put on a military uniform, but this time it was as a German soldier in the television show scene. I am honored to bring the tale of these 2 great Baseball Hall of Fame inductees’ and ex-soldiers to you on this Memorial Day. I am an ex-United States Army Reservist who stepped on the soil in Kuwait on February 23,1990 as a freshly minted Master Sergeant. 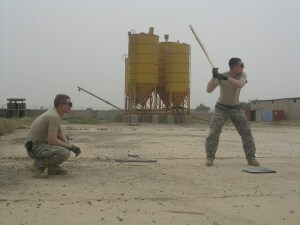 Until that day I could not fathom the emotions that would come to a swift head in and around me in a combat situation. With an insurgence of pride and courage both my unit and other advancing troops showed such moxy and bravery during that initial first thrust into this occupied country that makes me still stand so proud today. On this Memorial Day 2011, I personally salute every man, woman and civilian who has served for their bravery and courage to defend our rights with honor. For so many of the players of this grand game I love so much to also answer that same call to duty only makes this salute more personal to me. Until I served, I really did not understand the emotional tie that binds those who serve, and now can relate and admire the feelings and the emotions of my father who served bravely in the South Pacific. Until I put on my uniform I might have been one of those people who had taken my freedoms a bit lightly. But now, after seeing the sacrfices of others, and knowing the true spectacle of battle and its after effects, I stand tall and proud and pray for everyone currently stationed both in harm’s way and in safe harbor for their efforts to preserving those rights for all of us today. I am no longer eligible to serve, but if they ever changed those age limitation or need a call to arms, I would be there in a heartbeat once again. First off, I do not blame any of last nights beanball shenanigans and ultimate bench-clearing by both squads on Boston Red Sox reliever Franklin Morales. If you saw a camera view of Morales just after the plucking, you can see he meant no personal glory or want to throw behind or at Tampa Bay Rays DH Luke Scott, he was following the orders sent in from his arrogant Coaching staff. My anger and frustration is poised directly towards the Red Sox bench, and in particular 4 main characters. The first person was right at ground zero, and should of known better than to stand in front of a increasingly angry hitter still clutching a pine bat in his strong hand. 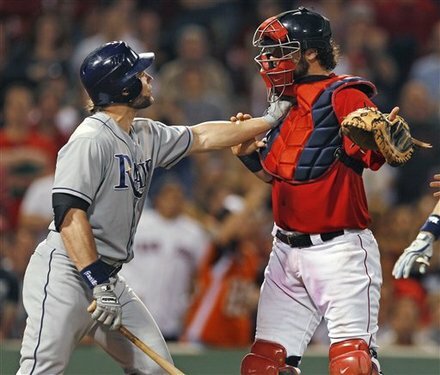 Standing in front of a player, blocking his path is one thing, but to chest bump him….That only makes the anger vented towards Red Sox backstop Jarrod Saltalamacchia and away from the true instigators in this plucking. I seriously felt Salti would of deserved a pop in the kisser with Scott standing over him grinning like a Cheshire cat. Even though Saltalamacchia made an error in judgment by bumping Scott, he is not the sole individual who needed a smack down. Instantly I lost all respect for the Boston Coaching staff. Suddenly they went from cunning rivals to blatant idiots, all in the time it took for the ball to leave Morales hand and hit Scott. What was the Boston bench thinking not only tossing the ball behind but at Scott for the second time in two games? Did they really think Scott would just stand there and chuckle as he made his way to First Base with the free pass? Worst yet, when the two benches did clear, it was two members of the Boston Coaching staff who made the most noise and provided the most pushing and shoving. Way to be positive role model gentlemen. You acted more like the small percentage of Red Sox hooligans than members of a MLB staff. I expected more out of Red Sox Bench Coach Tim Bogar, especially since he spent time on the Rays staff and knows the demeanor and attitude of Rays skipper Joe Maddon. I know in his heart and mind Bogar knows Maddon would not start this kind of retaliation, and what happens now is firmly on Bogar and Boston Pitching Coach Bob McClure’s heads. Sure Red Sox Manager Bobby Valentine gave the head nod to start it all, but he was not out their with his hands firmly on Rays 1B Carlos Pena’s jersey and undershirt. Bogar was right up into Scott’s grill and possibly deserved a beat down, but Scott did the wise thing and took the verbal abuse and let it wash pretty much right off him. 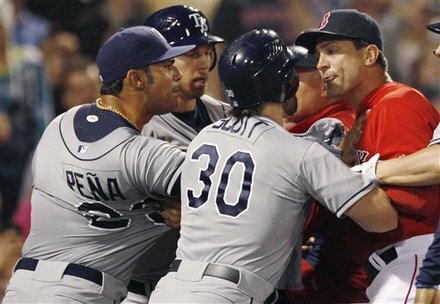 I mean McClure is the Coach who was jawing it with usual low-key guys Pena and Ben Zobrist when suddenly McClure grabbed Pena either trying to get him to see his way, or provoking an even more violent counter-action. I did not see a single Red Sox player come into the field of play with the hostility and bravado of these two Red Sox Coaches. Sure a few players did some pushing and shoving, but the vocal and physical action of these two Coaches demand some sort of suspension and definite fine. I can forgive Salti for his action of bumping Scott as a product of the first response to protecting a teammate, but I do nor and can not give the same pass to the Bogar and McClure. What is kind of confusing me further is the fact Boston had just started a bit of a come-back in this contest, and did not need that extra emotional energy. That is what makes this all even more confusing. Your team is starting to figure out the Rays relief staff and then you throw a further monkey wrench into the plans of stirring up emotions and tempers? This was downright insane. I am leaving Valentine out of the cross-hairs for this moment. Not that he should be equally guilty and subject to a future salary plucking my MLB, but he did not make matters worse after the fact. He did not go out there and berate Maddon or tussle with a player. 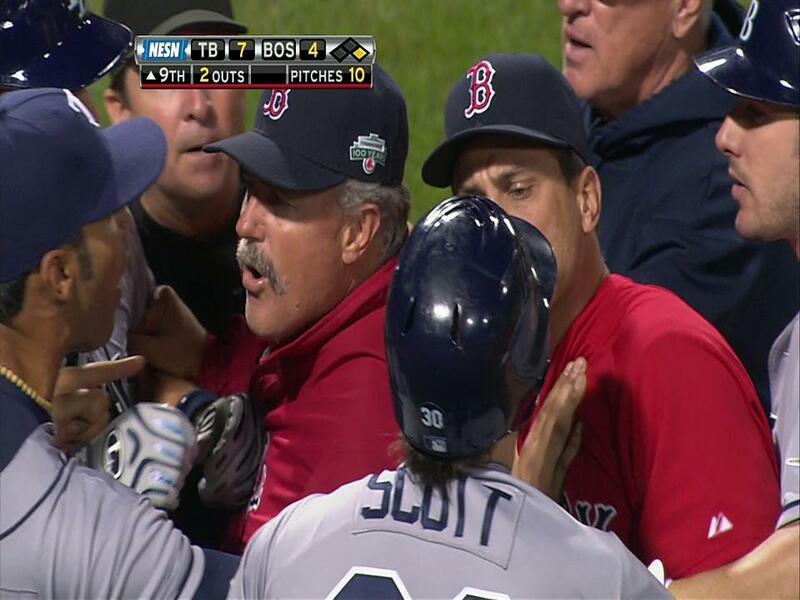 When a member of an MLB Coaching staff goes out there and gets physical and vocally aggressive with a fellow player not in the main mix of the situation…heads should roll. 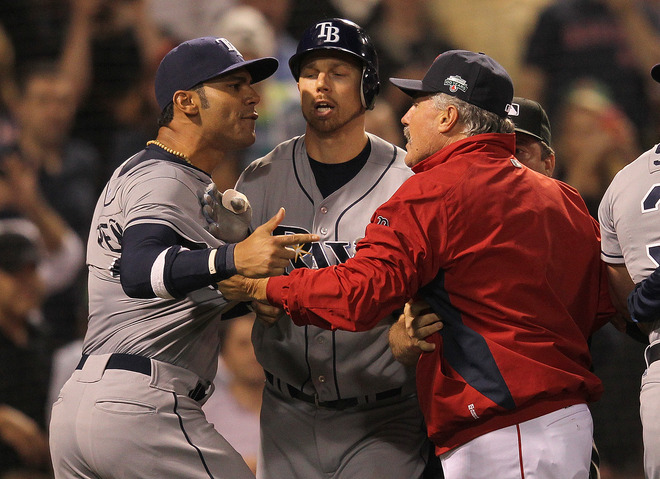 Sure Rays Coaches Tom Foley and George Hendricks were also a bit animated during the bench clearing moments, but they did not make matter worse or hasten the situations, they voiced their opinions and tried to keep their players from doing anything to a Boston player. A Gladiator is deemed one who is an armed combatant who entertained the audiences in the Roman Republic with violent confrontations and engagement with both fellow warriors, animals and in some cases, condemned souls. The term gladiator is actually Latin in origin meaning “swordsman” from the original word “gladius” or “sword”. 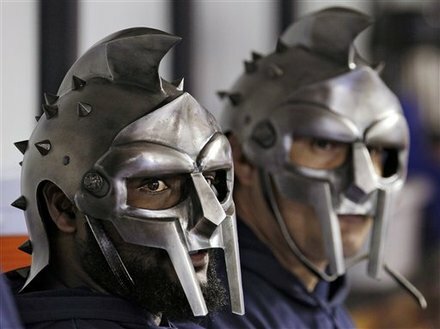 The first sighting of the rejuvenation of this classic Roman warrior reared its head on Monday evening when Rays closer Fernando Rodney (Maximus Savous Gameous) and his partner in battle Joel Peralta (Setus Gameous Maximus) donned the headgear of the Roman Centurions. It was quite a sight to see the pair of Bullpen comrades in arms sitting there stoic in the Rays dugout before their quest to the Bullpen. Seems kind of apropos that the Tampa Bay Rays have taken on the historic persona lately of these grand entertaining warriors of old as the game of baseball has always been about the attack, the mano-on-mano engagement of pitchers and hitters and the ultimate entertainment ebb and flow that pulsates throughout the stadium on any given play or action. Like their Roman counterparts, the end result is to gain the victory or die trying. Gone are the menacing lethal weapon of yore that combatants use to eliminate and produce pain and suffering upon their victims. Today clubs made of ash, maple and pine replace the menacing swords,and deadly weaponry. Leather padded fielding and batting gloves and other assorted protective gear aimed at diverting blows and direct hits have replaced heavy and restricting chain-mail, shields and armor. A sphere of white leather is the fondest tool of their trade. It can be thrust, scuffed and even propelled to heights and distances beyond the arena’s turf and into the hands of the new (Rays) Republic. But today just as it was so long ago, the men who partake in these games do it as much for the adulation and cheers of the crowd as they do for their fellow combatants. For it is the cheers or jeers of the assembled masses that energize, vitalize and make these men want to fight to the last out, cursing a loss as if it was the admittance of an open wound. The Rays Republic have always been vocal to the cause and effect of their combatants, showing praise even in the dire times and pure adulation in the moment just after securing victory. In that manner, the two societies inter-mingle with grand clarity. 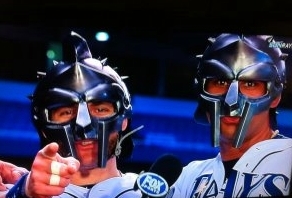 Then after last night’s heroics, 2 more legionnaires of Rays descent Carlos Pena (Hittus Ballus Longous) and Luke Scott (Wolerinous Magnus) made their on-screen appearance bearing the same garb and distinctive helmet accessory as Rodney and Peralta a day earlier. It really was a great interview, with the crowning touch of Scott looking deep into the camera lens possibly scaring a few young kids ( hopefully not). But that goes to show the character of this team. They are a true band of comrades battling it out in a 162 game war that has seen its share of casualties and heroic moments. 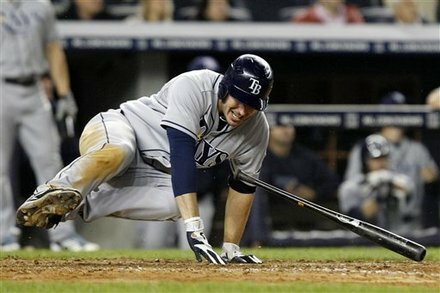 I always thought the 2008 team had that special something, possibly that extra sports chromosome that would bring them victory in November, but we all know of the Fall of the Rays 2008 Empire. This season’s team feels more energized and bit more prepared for the long journey again possibly into those cooler night when victories are savored and cherished for eternity. 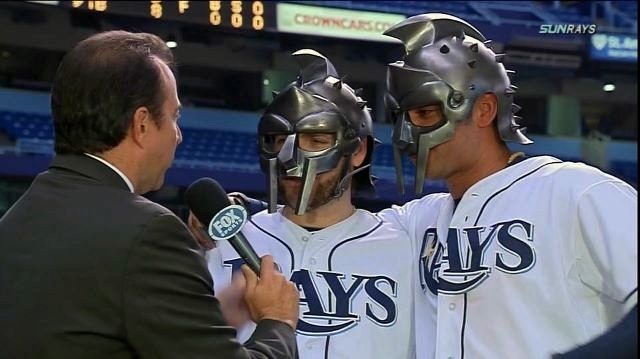 This Rays team does bode well with their Roman counterparts as each fought to preserve their way of life or process. Both have brought innovative ideals and procedures to fill their arsenal and each reincarnated past winning strategies and forgotten maneuvers and thus them up for all to see and bask at as they take their victories. Like their Roman counterparts, these modern combatants live a better life compensated for their grand actions and reveled by the throngs of the Rays Republic for their game day deeds as well as their action off the field of battle. And their mentor and Field General Joe Maddon instills the truth and balance that makes this whole unit stand united as well as loose and ready to change their battle plan at a tip of the cap. Fine tuned plays, signals and the rhythm of playing together as a single unit has strengthened their resolve and boasted their confidence as they strut onto the turf, just like the gladiators of old. I think the Roman Emperor Commodus would give a robust “thumbs up” to these modern Rays gladiators. Tropicana Field’s Tract has an Unfortunate History, but Maybe Not “Cursed”. When people asked me if Tropicana Field is cursed, I sometimes do not know what to tell them. I guess it depends on what you consider a “curse”, and what you consider a flaw in judgment or design. Either way, I think the tilted cap in St. Petersburg, Florida has had it run of bad luck, obscure historical factions, and maybe a few disgruntled former residents both in and out of the dirt. 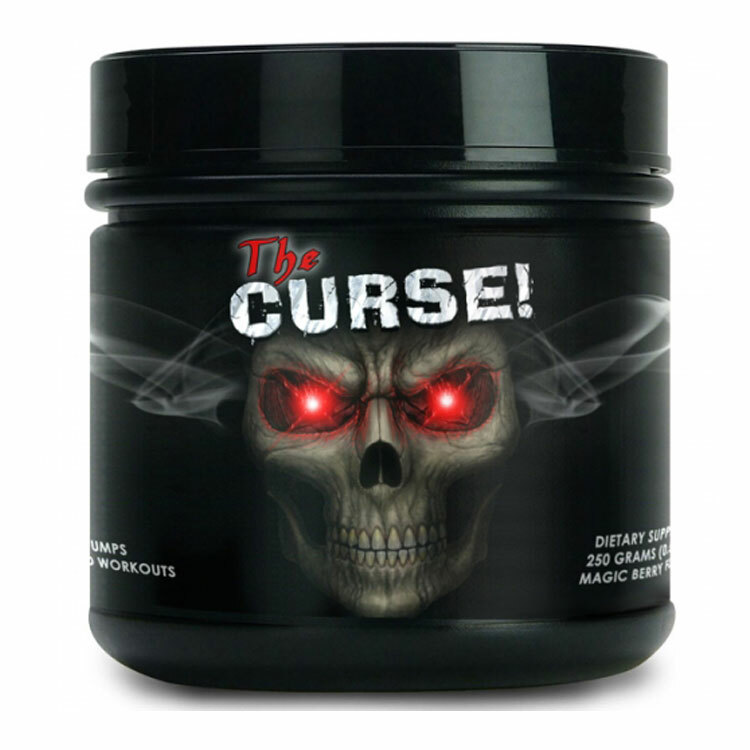 The word “cursed” to me definitely bring out negative energy, and with the rash of recent injuries, some downright insane, I can see the logic for people thinking this place might need a exorcism or sage cleansing ritual. Cursed is a powerful word. One that drums up evil intentions and vibrations that can come from both above or below the sandy soil of this region. For that matter, possibly the Trop is cursed per se, but only because of the past inhabitants or procedures done on this site before the stadium was erected. People forget the long history of the corner of 16th Street and First Avenue South. Before the city of St. Petersburg decided to erect this futuristic arena to attract the eye of a Major League Baseball tenant to come play among the filtered Sun streams in 72 degree splendor, there was plenty of prior notion and movement that could have conjured up hostile spirits both dead and alive. Some tales say a resident of a Caribbean nation practiced rituals condemning the new construction on the site of her former low-cost housing development bulldozed down after city officials ruled it was in the way of the progress of baseball. Whispers went through the wind that such rituals were performed on the construction grounds and might be the basis of any curse. Still even earlier before the housing unit was even a figment in anyone’s mind, 3 different cemeteries called this area their final resting places. 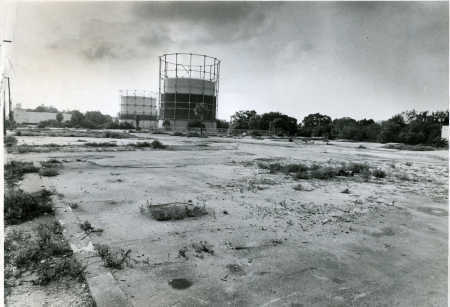 Oakland, Evergreen and Moffet occupied the rolling acreage that is now home to the cars, trucks of those gathering to watch Tampa Bay Rays games. 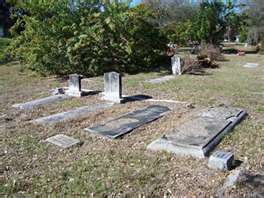 These cemeteries held the final resting places of Civil War veterans, founding community leaders of this city, and was the local burial ground for the Sugar Hill and Gas Plant district long before the city spread out towards the Gulf waters. In 1958, some 150 interned souls from the Moffet,225 from Evergreen were suppose to be transferred to the local Lincoln Cemetery to make way for the impending low-cost housing community. There is little or no reference to what might have happened to the souls who occupied plots in the Oakland Cemetery, even after the construction started on the Laurel Park housing complex. Ironically, this was the same complex razed in 1990 to make way for the new stadium. People forget this site used to be the City of St. Petersburg’s Gas Plant site in which two steel towers supported massive natural gas cylinders that towered over the region long before the downtown development went skywards. The aftermath of this contamination left by the residue of decades of gas deposits made the soil more like muck and it’s leakage down into the soil cost the St. Petersburg taxpayer’s a large sum of money to clean this area up enough to build a stadium without health concerns now or in the future. Even as construction began on the 175 off-ramp from I-275 in February 1976, a construction crew found old leg,arm and a ribcage while doing road prep. Old coffins, gravestones and even a human skull were discovered by road crews preparing the surfaces for the impending Interstate finger into the heart of the town. All within a Carlos Pena Home Run distance from the Trop’s Rotunda. Some even say unmarked graves, and their residents might still be scattered 6 feet under in and around the Trop’s location. But even if these interned souls linger under the asphalt and cement, this doesn’t make the Trop or the Rays “cursed”. Sure bad vibes could still be lingering from past souls, displaced families and resident of Laurel Park, but that probably doesn’t have any relationship to the recent odd happenings with this team or its players. Will Rhymes fainting into the arms of First Base Coach George Hendricks did not show or maintain possession features. Jeff Keppinger getting blasted in his right foot by a foul ball while sitting in the Rays dugout doesn’t portray demonic intentions or a “curse” interaction. Sometimes the action of someone saying a place is “cursed”, filled with negative energy or evil intent can spread like wildfire and then some begin to believe not only the hype, but the past lore that pre-dated this stadium. The recent run of bad luck or cursed behavior witnessed by the Rays players and their fans is more psychological than physical right now. Sure injuries are happening, but is the spirit of St. Petersburg founder John Williams causing them. Could a Civil War veteran be the cause of all this recent injuries, or is it just the plain fact this team has been riding a lucky star for so long, a little mis-guided mojo gets referred to as a curse. It all depends on your beliefs on if the past leads us during our present, or if we are deemed to repeat the past complete with good, evil and occasional accidents guided by prior events or entities. I guess the reality is that each of us has to decide for themselves their own conclusions, reasonings or justifications for the recent injury plague. 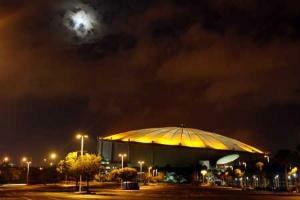 Whatever you final conclusion be it a curse, coincidence or just plain bad mojo, Tropicana Field will always have distractors, haters and people who want to conjure up this stadium’s evil catwalks, demonic light fixtures and the horrific sight of Raymond’s blue fur. 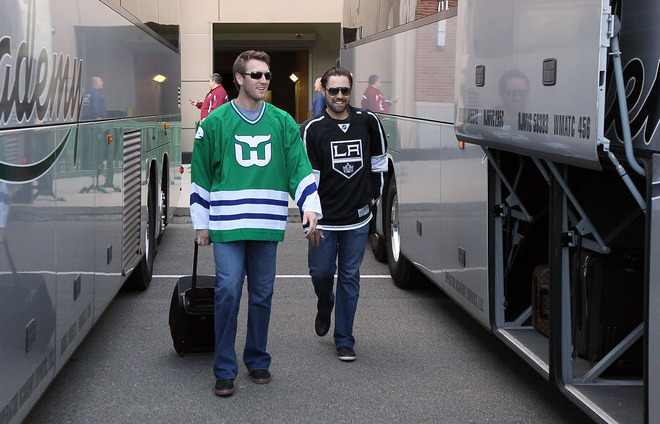 Everyone has their opinion, but I do not think this team is cursed or even damned…….anymore. They say imitation is the best form of flattery. 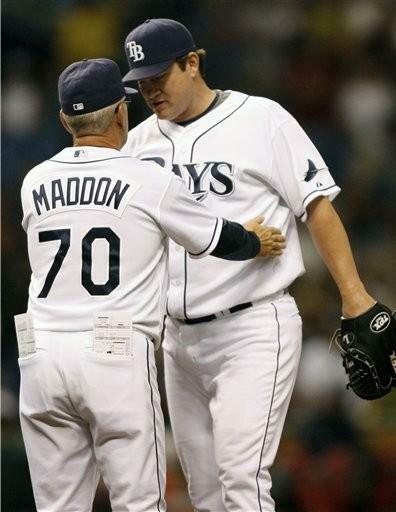 If that is true, Tampa Bay Rays Manager Joe Maddon is one proud skipper. Ironically, the latest person to get on board with a Maddon idea has not only a Tampa Bay Rays tie when he was our Bullpen Coach back in 2001. going further into the ironic pot is the fact this person was also a former Los Angeles (of Anaheim) Angels Manager who Maddon replaced as skipper after his resignation 29 games into the 1999 season. By now you might have guessed that current New York Mets skipper Terry Collins is the latest to follow a Maddon trend and institute it into his team’s rituals. We all know the rest of the Major League baseball world loves how Maddon reaches back into the past the pulls out past nuggets of baseball gold and wipes off their coating of dust and makes them shine brilliantly like the infield shift, the use of the 5-man infield, and walking in a run with the bases loaded to avoid a Grand Slam (Hamilton). All amazing blast from the past innovative ideas plucked by Maddon back into the 21st Century. But Collins has taken one of Maddon most brilliant moves and inserted it into his own Mets routine recently of doing the themed road trips. 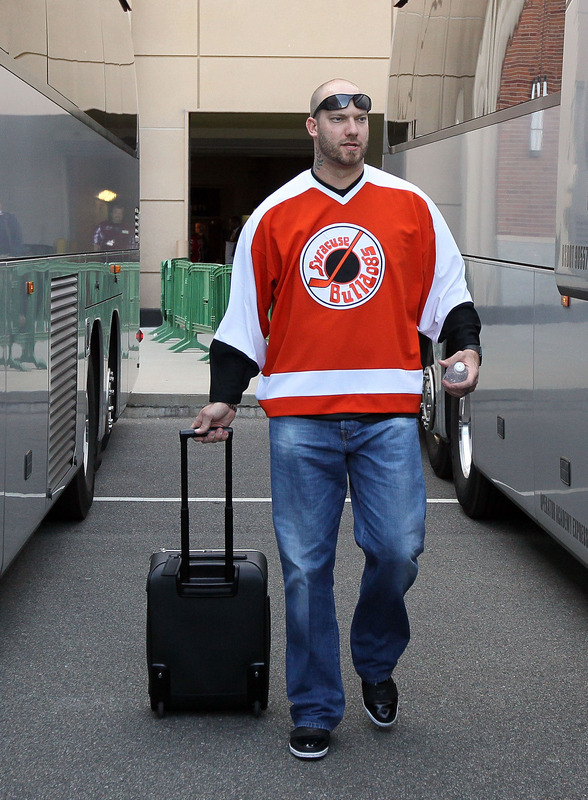 Recently as they embarked for their road trip the Mets skipper decided since so many NHL teams in his region were fighting for the Stanley Cup, why not have a NHL-themed road trip. It hearkens me back to a past Rays road trip where the squad popped on either Chicago Blackhawks specially made unis, or got to flash their own favorites for the rest of their team to enjoy or tease them about. 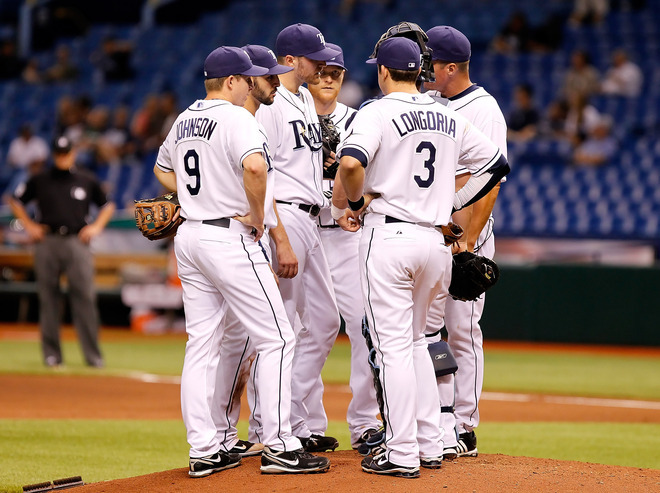 Collins must have decided to take on this great idea after seeing the bonds and commitment the Rays teams have taken in not only deciding their wardrobe, but committing to themselves and their teammates as they grew closer and more focused with the themed road trip having a distinct cause and effect to the team’s chemistry and character becoming more solid and united. If there was anything Maddon brought out of mothballs or introduced during his tenure, this road trip themed idea might just be league-wide before you can say “amalgamated”. And that’s a great thing since every teams needs something to take a bit of the focal point of a road trip and the perils that await them. I do not know seriously why all 30 MLB teams do not impose some sort of road trip ritual or theme as they head out on their excursions away from home. It seems to be a great bonding element for the team, plus the players seem to have fun trying to one-up their teammates or make a certain fashion statement. This is definitely one Maddon-ism I hope every team adapts ASAP. 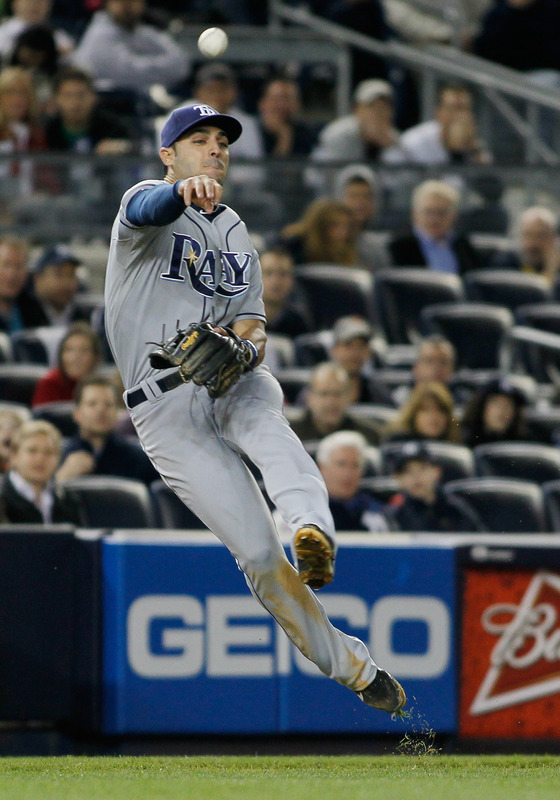 Sometimes I think we forget how lucky this Tampa Bay Rays team has been on the injury front over the past few years. Sure we have had untimely injuries that set this team back a tad, but not since their 2009 season have the Rays had their rabbit’s feet and luck slap them in the face like this. It’s been a long time since this Rays franchise has looked more like a M*A*S*H unit than a competitive baseball team. It befuddles me a bit that we have a winning record and yet the boo-birds have come out not only targeting the wrong people, but also forgetting injuries are a part of the game, that is why there is a DL and call-ups to the majors. 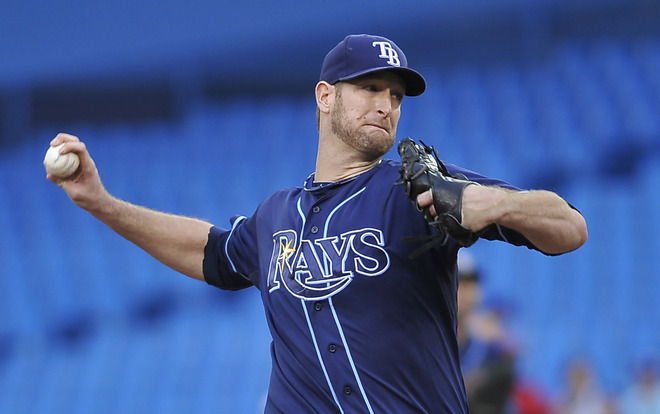 Even before Rays skipper Joe Maddon and Rays Head Trainer Ron Porterfield got Rays starter Jeff Niemann to the Visiting Clubhouse last night in Toronto, fingers began wagging and spit and vinegar ruled the roost. 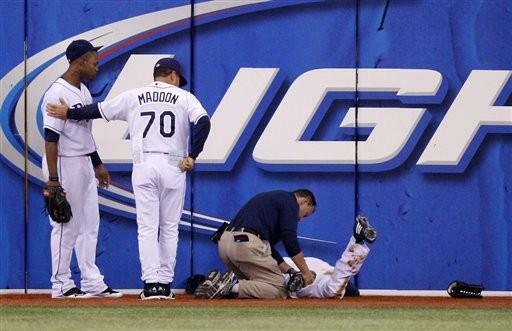 Heck, it not so long ago a Rays team dealt with this same rash of unforeseen injuries and watching players fall like Dominoes…I would think we would have learned a bit of ranting restraint since 2009. 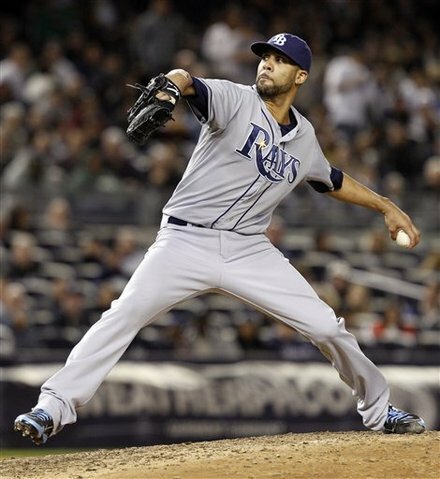 Back in 2009 12 different Rays hit the DL at one time or another and amassed a hysterical number of 752 games missed over that 162 game season. Some spent as little as 6 games on the pine ( BJ Upton/shoulder surgery), while others, like the trio of RP Jason Isringhausen (137 games), RP Troy Percival (119 games) and OF Fernando Perez (130 games) spent most of the season either on the mend or recovering from some sort of surgery. 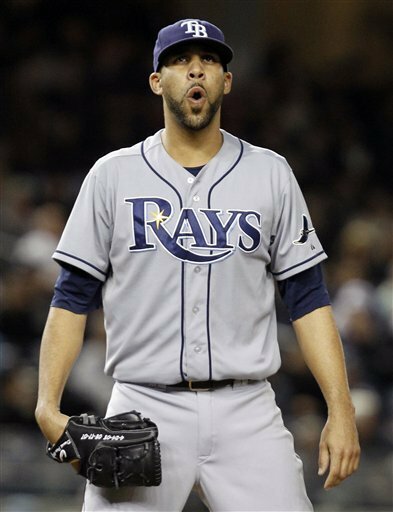 This 2009 season was also the Rays season Carlos Pena missed 25 games due to a badly placed ( cough, cough) CC Sabathia pitch inside with a duo of fractured fingers. The 2012 season is starting to become a bit of a mirror image of that 2009 injury riddled team, and I think we have not seen the end to the injury bug. How weird is it that both this season’s squad and the 2209 ( June 16-26) edition had 8 players on the DL. Downright freaky to consider that team lost so many “games” to their injured comrades, and this 2012 team as of game time tonight have banked 153 games in the DL bucket this season, not counting Jeff Niemann’s possible 40-60 game estimate. 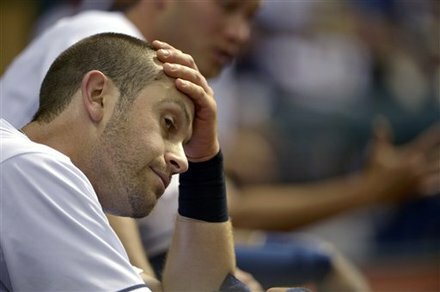 For some reason we all forgot that this Rays team might have finally used up all their “good luck” fairy dust and for the first time since 2009, the Rays well-oiled machine has broken down not from dis-repair, but from the possible stress and strain each team endures over that 180 days during a MLB regular season. Do not blame Porterfield, Paul Harker or Kevin Barr. I am sure Porterfield’s training room at Tropicana Field will be re-named “ M*A*S*H 33701” as the Rays players begin to arrive to the Clubhouse on Wednesday. Funny how as soon as Niemann left the contest there were cries and yelps about the Rays Training staff and their Strength and Conditioning. Suddenly the same group of Rays personnel who are considered by many to be one of the best in MLB were being thrown under a speeding bus without even a slight bit of fact or visualization to promote any wrongdoing or mis-diagnosis. I truly do not know how Niemann threw even a warm-up pitch last night without grimacing in pain after getting hacked by that drive. That determination to even try and stay in the game is a testament to the true guts and courage of this team as a whole. I bet each and every player , especially those nagging injuries they hold to themselves and that we know nothing about. But injuries small or large come with the salary, and sometimes letting them fester and linger are not worth the price paid in the end. Some players might even be playing right now on borrowed time, and that is not a good thing. Sean Rodriguez has a lingering strained pectoral muscle. Think about that injury for a second. S-Rod has a strained muscle in the chest region of the lead arm in his bat swing. Add onto scenario the blatantly obvious condition of throwing the ball diagonally across his body from the Hot Corner and you have to either be impressed or think Rodriguez is crazy to set himself up for a possible long term injury. Recent errors might be more due to trying to play through the injury than his throws follow through. I seriously do not know why S-Rod is taking the punishment and not resting himself, but then again, the drive and resiliency shown right now by just this one Rays speaks volumes to the commitment of every one on this 25-man roster. There is no conspiracy, no covert medical pandemic or lack of adherence to conditioning drills that have led to this recent outburst of injuries. The plan truth is this Rays team has been dodging huge bullets and taped up more than a few “walking wounded” over this season and some injuries go under the radar until they burst out into the daylight. Sports fans today want to point a finger, find a viable scapegoat to focus blame and their anger towards, and sometimes the wrong people get caught in the cross-hairs. How many people know Porterfield last night called the local NBA team, the Raptors last night trying to find an over-sized set of crutches to make Niemann’s pain a bit more bearable. You can bet Porterfield and his staff including Strength and Conditioning Coach Barr have put in plenty of overtime and extended hours mending, taping and even discussing ways this team can keep its members on the field, even for a minimal of innings or effort. 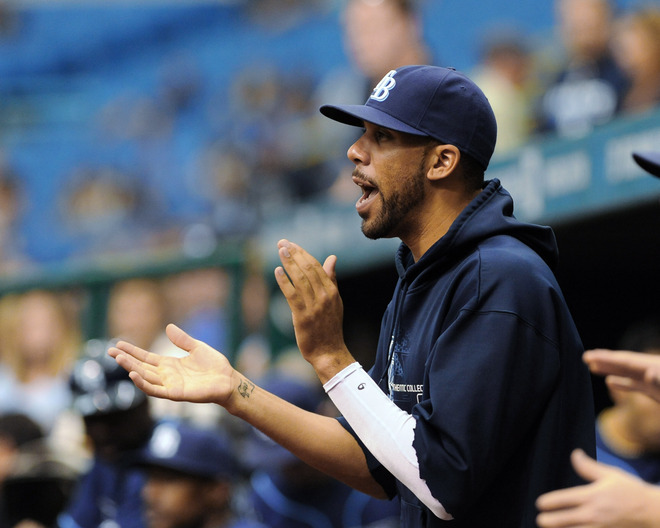 Will the Rays End Their May 14th Curse? Ohhhhh, I truly hate this date. Some have called me obsessed, pretty much bordering on insanity when it comes to the Tampa Bay Rays and their games on the date of May 14th. I have scheduled impromptu flights at midnight, fought with TSA and customs officials, and even caught a walk-off Home Run as the Rays Republic sat in awe at home in an extra inning contest. This date holds darkness for me, and I want the Rays star burst to finally shed to some victory light on this day. 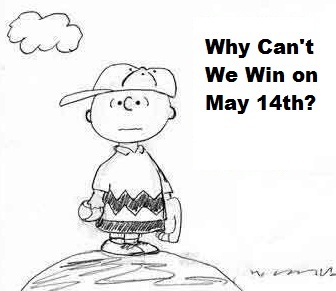 It is one of those days I always wished the Tampa Bay Rays would win a game, but in 12 previous contests on this date in their existence, failure has greeted them in the end. I have Tweeted about it, screamed to the high heavens, wrote about each of these past contest in posts, but still the smell of victory has eluded the Rays on May 14th. I have have done all I can as a fan to wish, pray and make a win materialize, but it always has ended up the same…an “L” in the box score. Even one of the Rays media hounds post about the Rays 0-12 mark on this date in the past, but did he actually know the Rays have been outscored 83-42 on this date? I think not. I wonder if this media guru did any additional background work and found out that in 1998 Russ Springer was the first Rays hurler to throw on this date, with Wade Davis, who is now in the Rays Bullpen, throwing the last 2 losses. Wonder if this same media figurehead knew that during the Rays 12-game losing streak on this date, 6 of those contests have been 1-run losses. Some might say the Rays inaugural season (1998) 2-10 loss in Kansas City against the Royals or possibly their 2002 3-10 drumming in NYC by the Yankees might be their worst faring on this day, but I disagree totally. 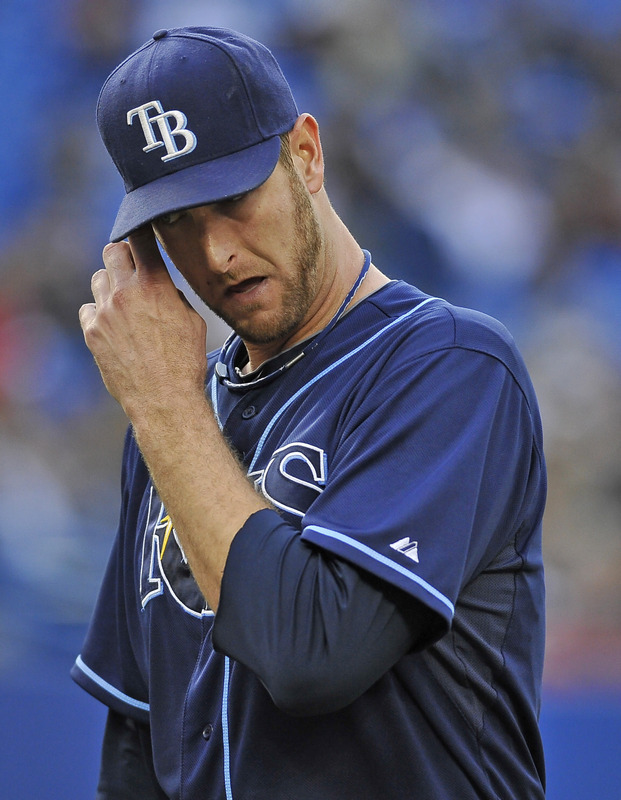 To me the worst showing on May 14th came just last season when the Rays got shut out at home by the Baltimore Orioles 6-0 and fell to 23-16 on the season. 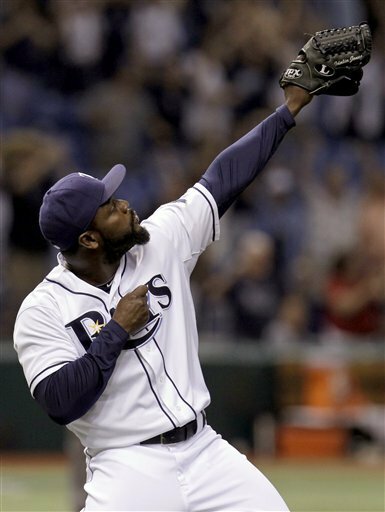 How could you have imagined a loss on this date when we even had a pitcher who threw 2 No-Hitter’s throwing on this date (Hideo Nomo), plus a clutch hurler known for his Big Game prowess threw twice on this date(James Shields ) and a future Rays sweat-inducing closer (Esteban Yan) could not help this team muster a win. 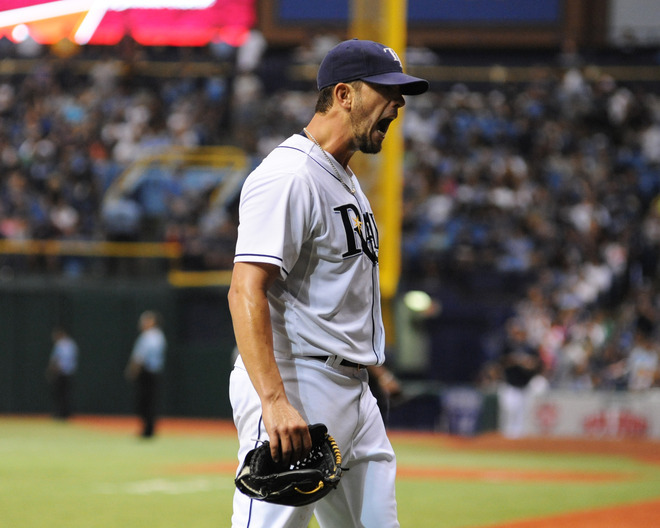 From Springer to Davis, the Rays have turned to 10 different pitchers and still we have been winless on this date. I have attended all 12 of those losses, but I will not be in Toronto tonight for the lucky 13th try at victory on this date. I was in the stands in Kauffman Stadium for their first May 14th loss, and even caught the Casey Blake Home Run ball in their 10th inning Walk-Off loss back in 2004. It was a sick feeling watching former Rays closer Lance Carter peer up at me as I clutched that ball, but it was hit straight at me on a line…an unfortunate present for the day. Some say I should have dropped the ball, but it seemed like a destined shot, and fulfilled a nice deletion from my baseball Bucket List. Even the promise of a former Rays First Round Draft pick named Dewon Brazleton could not muster a win on this date, but he did come close as the Rays only lost by a solo run to the Toronto Blue Jays (7-6). 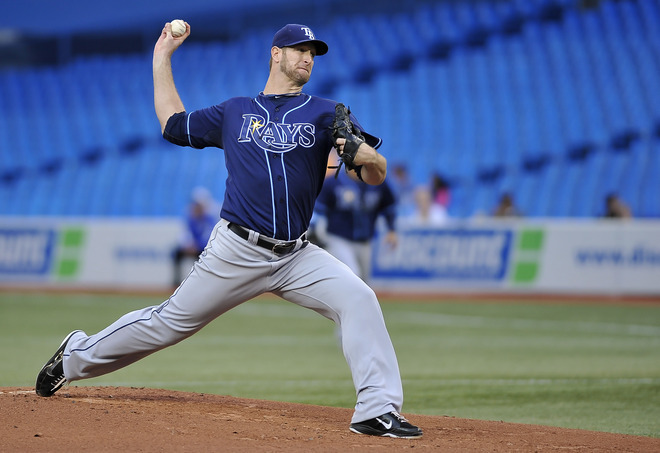 And it is a bit ironic the Rays take on these same Jays today. Especially since they hold a 3-0 record against the Rays on this date, it would be extra special for the team to finally put an end to this streak in Canada. 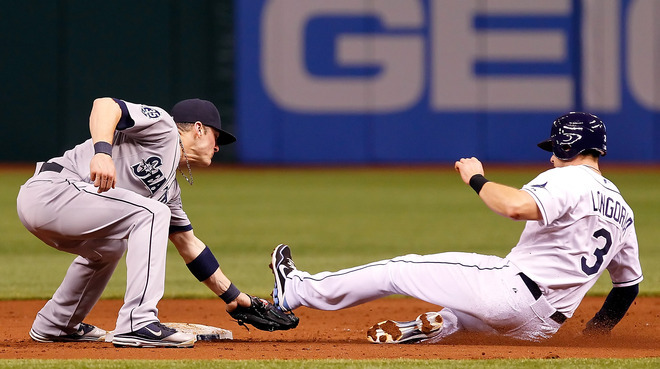 Springer, Kevin Witt, Yan, Travis Harper, Brazelton, Paul Abbott, Nomo, Casey Fossum, Shields and Davis have all gone to the hill wanting victory, but have seen the game’s gasp go to the opposition. I hope on this 13th try, when I will not be in attendance for the first time on this date….a win finally comes to this team. It would be a glorious present, and one I would cherish always. Who doesn’t want a win posted on their special day. Ahhhhh Mother’s Day. 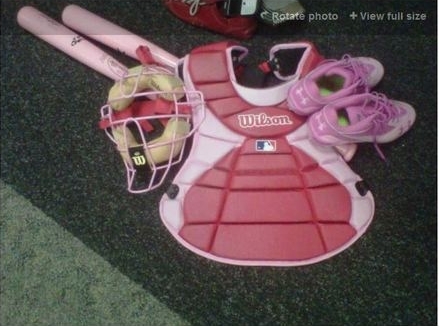 That one day a year when Major League Baseball uniforms all over the league become awash in pink both on field accessories which include a splash of maternal pink lacquered upon equipment. From wristbands, batting gloves, cleats to Louisville Sluggers the homage to Moms’ is not only symbolic, it is down right sugary sweet, just like my favorite “Mom meal”, hot cakes, country sausage and fine Maple syrup. 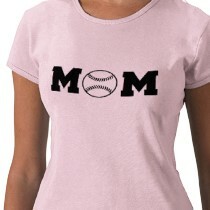 Someone asked me a few years ago why we celebrate Mother’s Day at the ballpark. I told him we celebrate it for those thankless years of “mom” pushing us in the minivan/station wagons and driving us to endless games and practices as kids. We celebrate it to the one person we want to see proud of us as we play this game and seeing them cheering in the stands brings us to another level. We celebrate this day because it is a thankless job done with only the fuel of love, encouragement and the want for their children to be happy in this life. I have had the honor of having two “moms” in my life. My birth mother, and my adopted Mother who took me into her arms as her own and cheered and clapped with pride as she watched her jock son compete. 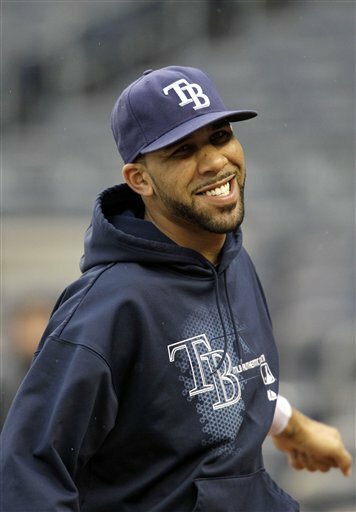 I wonder how many of the Tampa Bay Rays Mothers and wives and their offspring will be attendance today? For it is a special feeling looking up in the stands and seeing the mother of your child, or the one who held you tight and taught you valuable lessons in life celebrating your successes on the field. It is a day that MLB also brings about Breast Cancer Awareness to the plate as survivors and fighters alike take the field as ceremonial First Pitch participants on their fight to strike out this devastating illness. The Susan B Komen Foundation takes the lead-off spot in this special day’s line-up as stadiums and teams show support, love and salute the courage, drive and determination of not only these brave women, but also their support system that surrounds them. 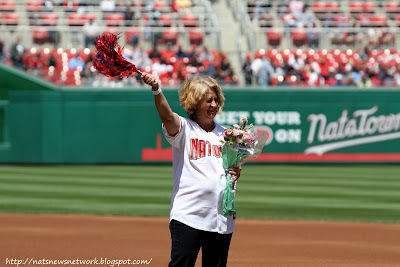 This is one day of the year I attend games with great joy and celebrate among you wanting each and every Mother in the stadium to get her own special moment, recognition for taking on one of the hardest job in this World, and completing it like it was a simple chore. But that is what “Moms” do, they make the difficult seem easy, bring about confidence, excitement and send us on our adventures in our lives, even after we are grown and gone from the nest. 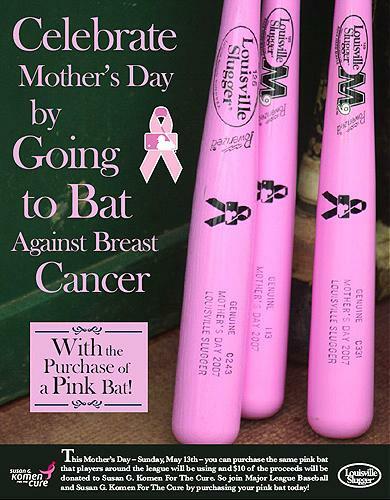 So I hope each and everyone of you who can takes your Mom to a game today. Take in the atmosphere, exhilaration and honor bestowed upon the woman who only wants to be repaid for all her endeavors in her family life with a hug and a kiss. Today is a day to celebrate all things maternal, and God bless them for taking on the task and pulling it off like champions. Enjoy your day Moms’. The funny thing about baseball is, we all think we have answers, have professional knowledge from watching hundreds of games either live or on television. We gain our expertise per se from announcers, visual observations while most of us have never played above the Little League level. It is almost as if baseball has issued to the fans its own version of freedom of speech, but with the advent of social media now, can it go too far? In the stands sometimes the collective fans themselves can take action, embarrassing the foolish rants or possibly make sure the “offender” takes a chill pill and remembers a game is in progress and he can be removed if enough fans voice their own raves. It doesn’t happen often that a fan either for the home or visiting team goes beyond that baseline of respect or coarse language, but when they do, most players just let it wash off them like gentle raindrops. Every once in a while you hear someone say something to a play you know hit deeps, crosses that imaginary line and you wish he had done anything to spank the oppressive fool. Well, recently one Major League player decided someone had gone a bit too far. No, he did not go into the stands like a hockey enforcer or launch a 94 mph rocket to the kisser of the offending ruffian, instead he just cut and pasted the obscure comments and let the word know what he sometimes has to deal with outside of our usual Twitter visual sight-lines. Sure the comment might have lacked a bit of killer intentions, but sometimes something written gnarls at you and you feel compelled to at least comment or write a rebuttal. Price definitely took the high road and just cut and pasted the comments so we all can see and know the type of absurd and unintelligent rhetoric nonsense these guys get after fighting the good fight during a game, an inning or even a career. I left off this guys Twitter handle from the posted comment to not advertise his ramblings any further because his baseball and pitching logic definitely ranks below the bottom of the barrel. But there is one comment he made first that got my attention and definitely shows spending a lot of time watching games at Tropicana Field doesn’t make you a baseball guru or Coach. I am glad this guy has Rays Season Tickets and supports his hometown team, but in that same vein, if he has truly attended multiple seasons of games, he must have slept through many of Price’s great moments on the hill, especially in 2008. Sure I went to the past well there for a reason. The guy stated Price “ had no closeout pitch”. Well, hate to tell you, amassing a 5-2 record in 2012 and a 12-13 last season, Price has got to have a “closeout” something to get those “W’s”. Of course this rant came after Price and the Rays lost a game to the rival New York Yankees and former A L Cy Young winner Sabathia. I understand the frustration of seeing this team lose after posting an impressive recent home stand, but at least know the facts before boasting your “expertise”. Lost somewhere in his multiple baseball brainiac cells is the true stat that this loss by Price to his fellow southpaw Sabathia was his first “L” against this opposing hurler in his career. Could this commenter have some merit since Price did give up a historic Home Run to Yankee Derek Jeter for his 3,000th career hit in 2011? But doesn’t every pitcher want to be on the hill when a historic moment is approaching for a rival and want to either strike them out, prevent them from reaching that plateau or unfortunately being cast into the annuals of history by missing their mark. Still, Price has battled 5 prior Cy Young winners in 8 starts during his career before his May 10th loss to Sabathia and had a 5-0 record with a stellar 1.69 ERA. 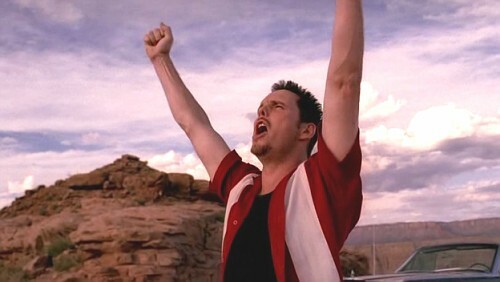 Did one bad start and sub sequential Home Run barrage by Yankee Curtis Granderson make Price a second tier pitcher? I think not. By the way, a winner wants the ball in his hand during big games, so if this commenter is dipping back into the past as far as 2010 when Price fell twice in opposing duels with ex-Texas Ranger southpaw Cliff Lee, that is digging for dirt in the wrong playground. 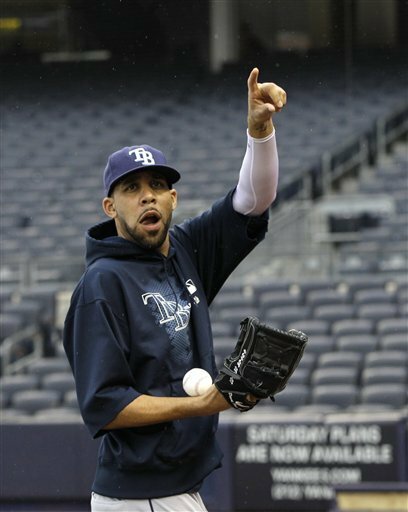 Price, just like fellow Rays starter James Shields eagerly wants this tough games and moments that either elevate or humbles you. Sure it can boast huge amounts of frustration and wreck confidence, but Price is a man, and has handled himself as one, even with this comment missile to his integrity. I do not condone someone ranting without purpose or reason, especially when it comes to sports or our hallowed athletes. Have merit and solid facts to back up the claims and I might agree, or agree to disagree on the subject. Either way, attacking or even suggesting something moronic like your second two points in your comment are ridiculous and warrants this wake-up call. I have yelled and posted a few things in my time that I regret, wish I had thought out and either deleted or apologized for. I do not expect this commenter to do either of those things. He feels he is in the right. Had his ducks perfectly in a row and is firm in his convictions, even tho his logic has more holes than a wheel of Swiss cheese. But in the end Price took the right measure, let the fellow Rays fan baste and boil this fan a bit, and Price just sat back and watched the magic happen. Just goes to show you, sometimes these guys see and hear your absurd comments and rants, and one took it upon himself to hoist you to the wolves. Good for him.